It had lightened up slightly as we arrived in Newcastle, but the weather quickly changed without warning and we were once again battling strong gusts whilst pedalling down Main Street. There was nothing for it but to take shelter in the nearest café, and luckily for us, it happened to be the Savoy. It might not look like much compared to the London hotel with which it shares a name, but don't underestimate this modest establishment. Their seafood chowder is fantastic. Creamy and piping hot, with slabs of wheaten bread on the side as the Lord intended, Neil could have eaten a bucketful of the stuff. Jess looked on with major food envy, but her toasty panini was equally delicious, so there were no losers here. Whatever the weather, this place will sort any hungry rider out. We reluctantly left our warm cocoon to head over to our bed and breakfast for the night. Any minute now, the skies would unleash their fury and it was a race against the clock to see who would drop first - the rain or us. Yet another circuitous one-way street system had Neil's knickers in a twist again, and we had to head a fair way out of town just to hit the right road to get back in. Well, perhaps "had to" is too strong a term - as it turns out, we could have got off the bike and pushed down the street, for The Beach House Bed and Breakfast was just a few meters away. Honestly, the rest of the world needs to visit New York City once in a while and get a lesson in the safety features of jaywalking. The Beach House is a classic British seafront B&B – a family home at the back, guest rooms at the front, and for a century or more, it's stood here taking a beating from the Irish Sea. The owner greeted us cheerfully at the back entrance and helped park our bike in the optimistically-named "sun room". Our room was just off the second-floor landing and had a comfortable double bed, bathroom, TV, and free WiFi for £80 per night. It was on the dearer side compared with the last few days, but that's seaside resorts for you. Plus, we had a theoretically fantastic view of the sea and the Mourne Mountains, both of which were currently obscured by clouds. After melting our brains with the latest episode of The Jeremy Kyle Show (like a British version of Jerry Springer, but with even more foul language and fewer teeth), we took a deep breath and walked through the front door into the howling rain. It was atrociously pishy outside - Jess actually went so far as to backtrack into the house shaking her head. But this was by no means the worst weather we'd ever experienced on a bike trip (so far), so with a shudder, we quickly ran towards the only thing that could save us now - food. As in Ballycastle, weather like this gives us a strange hankering for fish and chips. So onward to Doc's we went, not because it was the best-reviewed spot in town, but because it was precisely a 36-second walk from the B&B. We enjoyed a proper haddock and chips and a spot of people-watching. One customer was a uniformed police officer who caught Jess's eye firstly because she was female, and secondly because she wasn't carrying a gun. Neil found none of this unusual, least of all the fact that a PSNI officer was in the chippy whilst on the job – it's a standing joke that they like their armoured Land Rovers because they can sit and eat takeaways in the back. Duly fed and watered, it was another 40-second trot through the downpour to the nearest pub, the Donard Hotel Bar. There, we set about our standard evening's activities: watch the football, catch up on our trip notes, play cards, and drink beer. Our experience of Newcastle can be summed up as follows: take shelter in the nearest café, eat dinner in the nearest chippy, and drink beer in the nearest pub. All in all, we'd say we explored about a 50-meter radius of the town thanks to the pelting rain. 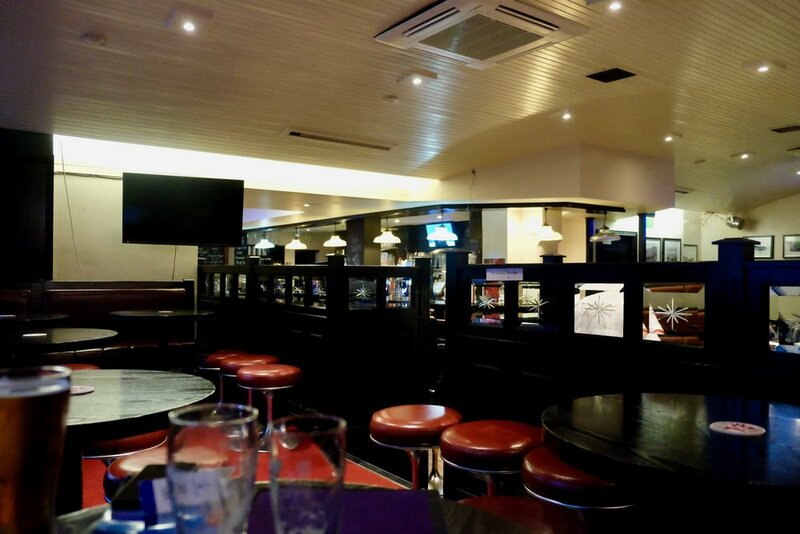 As our day drew to a soggy close, we sat contented in a near-empty bar, joking with the drunk teenagers next to us, who were watching the football and sweating on their bets coming up. Manchester United and Celtic came through for them in the end, but not without a great deal of swearing from our companions. A bit like our trip, we realised. All our cursing and complaining along the way will be forgotten, and all we'll be left with are memories of extraordinary good fortune. The bar of the Donard Hotel has surely seen busier nights. Neil in his element: pint, playing cards, football on the TV, and someone to poke his tongue at.